Almost two years ago we spoke for the first time of Qroom , an extremely simple website to listen to free and unlimited music from your browser . At that time the small online music project had a very simple interface with only one search engine and nothing else. Now, after a lot of work, Qroom has become an iOS application that you can download in the App Store and the web player has improved greatly to make way for playlists, recommendations, news, moods and more . 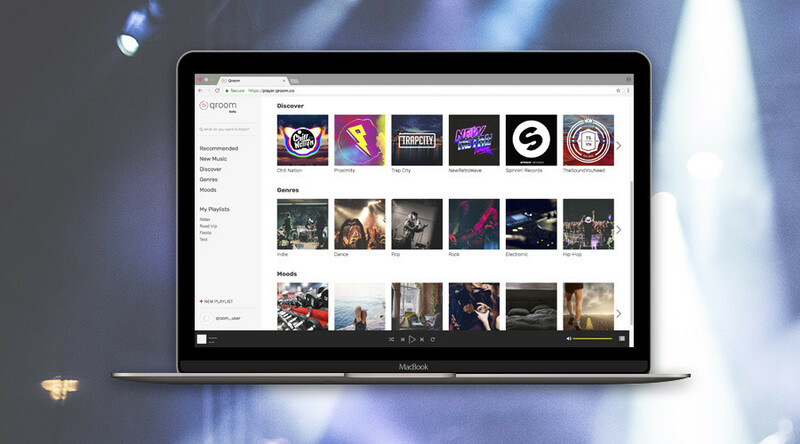 In Qroom you get more than 30 million songs to listen online, without limits and completely free. Qroom uses the YouTube API and displays the video in a small pop-up player when you play the song. Qroom is legal because we use the Youtube API and what we do is just index and generate a much more beautiful and comfortable experience for the user. The content is from YouTube not ours. In the future, in qroom are analyzing the possibility of monetizing with ads where brands can help lesser-known bands to have their videos reach new fans. Since it is a 1OO% visual platform. The biggest change we made was to develop a very modern app, where the focus is placed on the full screen artists’ videos. All the usability of the app is with swipe, as well as to move from one topic to another or to go playlists or home. I think it reflects a lot the new ways in which people today are accustomed to using an app. Like on Snapchat and Instagram. We take a lot of that usability and apply it to a music app. On the other hand the web player is much more developed than the first version that was only a search engine. It has genres, playlists, moods, etc. In the plans is also to create a version of qroom for Android , but for now they have not started to develop it.